After my first Devoxx in Belgium last year I decided to give the new UK spin-off a try. Martijn and Ben have been the perfect hosts for a couple of Java related activities close to the London Java Community and I was really looking forward meeting this incredible community in London. I've never been to London or even the UK before. Don't ask me why, it simply never happened. Even if some of the fellow ACEs have their home-bases there and the UKOUG also is very active in the Oracle User Group space I was very excited to finally see a bit of London. It turns out that I had planned my trip too short. Bottom-line: There was no time left at all to see a bit of the city. Once more I've only seen the nice little Airport, parts of the public transport system, the hotel and the conference venue. No, I'm not complaining. The travel was easy for me and finding the way to the BDC and the hotel next by not a bit challenge. A nice informal Meet and Greet sponsored by Atlassian was followed by a nice speakers-dinner. 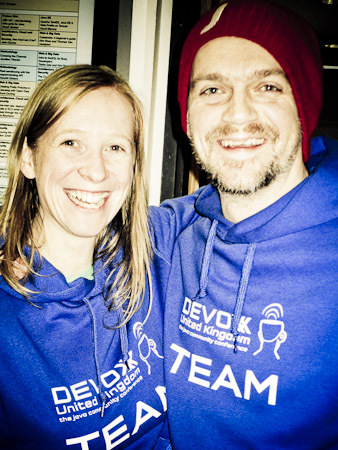 Thank you, DevoxxUK team! 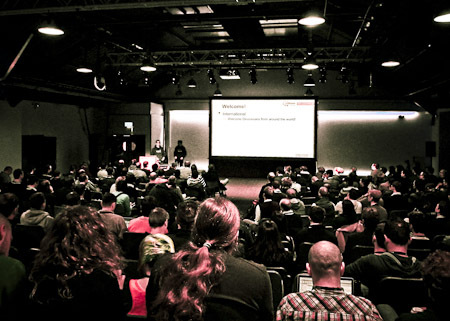 With Devoxx UK, the number of Devoxxians will reach 5,500 across Europe this year. 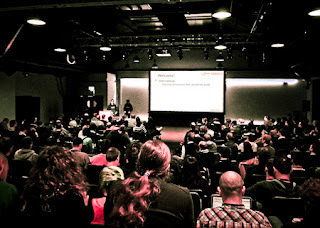 The hands-on labs, talks, quickies, birds-of-a-feather and bash run from 9:30am to 10:00pm and this has been long days for everybody with still plenty of time to hang around and talk to the luminaries in the Java world. Only draw-back was, that some of the speakers left early to catch trains to Paris. DevoxxFR started overlapping. The second day started over with plenty of engagement from anybody. The speakers full of energy were there to fully entertain the crowd. Fellow ACED Simon came in early to help with the UKOUG booth duty and we had some time to talk. I also enjoyed talking to Milton Smith about Java security topics. Not to mention the many others. It always is a pleasure catching up with you and attending the great session on the schedule. Close to noon I had to give my own session about Java EE sins. It is uploaded to slideshare and parleys (embedded below) in the meantime. Thank you to the roughly 50 attendees. It has been a pleasure. I am looking forward to the recording. After a nice closing keynote by both RedHat and Oracle I had some time to enjoy the local bar scene and talk to Tomas. Leaving London the next morning very early.